LA Tenorio had a solid game for Ginebra in their win over Phoenix. Did LA Tenorio travel or not? It’s a moot case now, though, as the Ginebra Gin Kings have notched their fifth against three losses in the 2016 PBA Commissioner’s Cup. Barangay Ginebra San Miguel showed some of their famed never-say-die spirit as they came back from 19 points down and got a huge game-winning jumper from LA Tenorio to book a hard-earned 102-101 victory over the Phoenix Fuel Masters in an out-of-town clash on Saturday in Panabo City, Davao del Norte. Ginebra, trailing by one point at the time, grabbed a crucial offensive rebound with nine seconds remaining and shuffled the ball to their veteran point guard Tenorio, who was clutch for them again. He fired a jumper over Phoenix counterpart RR Garcia, leaving just 1.2 seconds remaining on the game clock to complete an epic comeback in a game they trailed, 58-38, at one point. Greg Slaughter had a monster performance with 28 points and 13 rebounds, while import Othyus Jeffers also notched a double-double with 24 points and 14 boards. 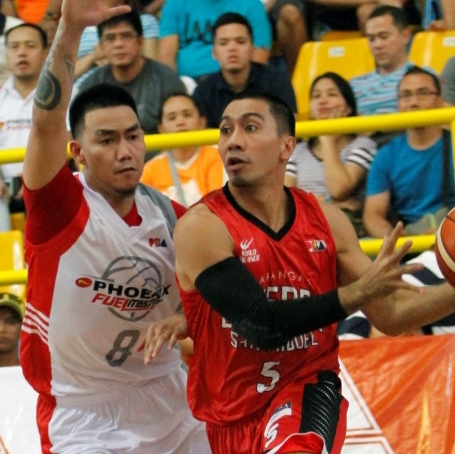 Tenorio also had a huge game, finishing with 17 points, six rebounds, and nine assists as well as the go-ahead basket that sealed it for Ginebra, which won for the fifth time in their last six games. The Kings improved to 5-3, while the Fuel Masters fell to 2-5 for the conference. Kevin Pinkney finished with team-highs of 24 points and 14 rebounds for Phoenix, while Garcia finished with 23 points and nine assists in the loss. It was the second straight defeat for the Fuel Masters and their fifth in the last six games.